Osage City Police Officer Nathan Purling is congratulated by Mayor Quintin Robert and Police Chief Fred Nech during presentation of an award for Purling’s lifesaving actions to save a woman who had tried to commit suicide. 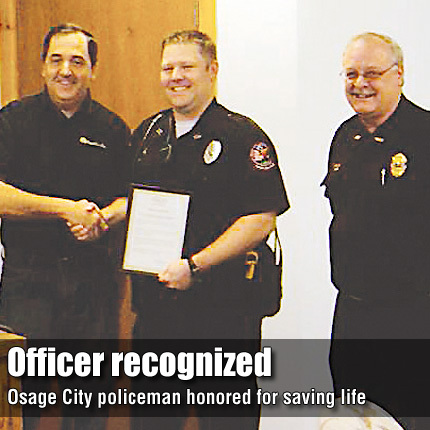 OSAGE CITY—A proclamation recognizing Osage City Police Officer Nathan Purling for actions taken to save the life of another was presented by the mayor and city council, while Purling’s family and members of the Osage City Police Department looked on, last week. Osage City Mayor Quintin Robert read the proclamation at the beginning of the Jan. 25 council meeting, recognizing Purling for saving a woman’s life on the morning of Dec. 18. According to the proclamation, Purling discovered the woman inside her car after she tried to commit suicide. Purling took action to gain entry to the car and was able to save the woman from dying. Purling “performed a purposeful, distinctive and successful lifesaving act on behalf of another human being,” the proclamation said. In addition to the proclamation, Osage City Police Chief Fred Nech awarded Purling a medal recognizing the lifesaving act. Nech said Purling is a part time officer for the city and works full-time for the Osage County Sheriff’s Office. In addition, he has been in the New York Air National Guard and the Kansas Army National Guard. He served in Iraq in 2006. “We are exceptionally proud of Nathan and what he has done for our city and our community,” Nech said. In other discussion during the meeting, the council considered the purchase of a truck to replace a vehicle for the electric utility department. Bids were reviewed and staff recommended the council accept a bid from Branine Chevrolet in the amount of $21,434.55 to purchase a 2011 Chevrolet 1500 two-wheel drive regular cab truck. The recommendation was based on the closeness of the bid in comparison to the other bids, and the added convenience and accessibility for maintenance and warranty work from the local dealer. A bid for the same type of pickup was offered by Crow-Moddie Chevrolet at $21,487. Similar Ford pickups were offered by John North Ford, at $20,259, and from Crow-Moddie Ford, at $21,192. Osage City Council Member Gary Whalen questioned what criteria should be considered before a bid other than a low bid is accepted. Osage City Manager Nick Hernandez explained there is no specific amounts or percentages used to determine local bid preference, but the city may choose the best possible equipment, given all circumstances. Hernandez said he could research the issue and bring it back to the council. The council unanimously agreed to purchase the vehicle from Branine, with council member Ed Mueller absent. Council members also agreed staff should research the local preference bidding issue. • read a proclamation in honor of the Kansas sesquicentennial. • approved the 2011 Neighborhood Revitalization Act for Osage County. • set Feb. 23 for the city’s strategic planning session. • approved the city manager to apply for participation in the Leadership Kansas program. • noted candidate filings for council positions. • heard an update on the Osage City school building committee progress. • heard the first reading of the 2011-2015 airport capitol improvement program, which is reviewed and approved annually by the council. • discussed the memorial tree walk proposed for Huffman Park. The matter was tabled for further information. • held an executive session for attorney-client privilege with the city attorney Rick Godderz and Hernandez in attendance. No action was taken after executive session. • held an executive session for discussion of confidential data relating to financial affairs of second parties with the city attorney, city manager and city treasurer in attendance. No action was taken after executive session.